Diane Fox is currently the Early Intervention Program Manager at DODD. She leads a team of early intervention professionals responsible for providing technical assistance and training to local early intervention programs. Diane has worked in the field of early intervention for 25 years with experience providing social work, service coordination, and special instruction services on a transdisciplinary team in Ohio. She holds a Master's degree in Special Education from West Virginia University with a focus in early intervention. She is a licensed Social Worker through the State of Ohio Counselor, Social Work, and Marriage and Family Therapist Board and holds a professional credential from DODD as an an EI Specialist. Diane has extensive experience developing workshops and training for EI service providers that include understanding Ohio's early intervention system, the role and responsibilities of the EI service provider and service coordinator, functional assessment, and applicable federal regulations and state rules. Diane is very excited to support counties with moving towards evidence-based practices through the development of a high-quality, comprehensive professional development system. Steve holds a Master's of Early Childhood Education and Education Administration from the University of Findlay. Over the past 19 years, Steve has supervised Early Intervention, Preschool and School Age programs. He has provided training on understanding the Ohio EI system, EI policies and procedures, IFSP development as well as targeted trainings to county EI teams on compliance and evidence-based practices. He is credentialed through the Ohio Department of Developmental Disabilities as an Early Intervention Supervisor. Karen Kincaid has a Bachelor's in Child and Family Development from the University of Akron and is a Licensed Social Worker in the state of Ohio. She is credentialed through the Ohio Department of Developmental Disabilities as a Developmental Specialist and is a Certified PLAY Project Consultant. Karen has 17 years of experience working in the field of Early Intervention. Prior to working in Early Intervention, she worked as a Service Coordinator for Help Me Grow and in the field of chid welfare. Kelli D. Lanzot, M.S., LSW has been working in early intervention for six years. Prior to working with early intervention, she worked in the fields of mental health and child welfare. Kelli also has experience with providing high quality case management and parent education to children and families. Kelli attended Ohio Dominican University and received a Bachelor of Arts in both Sociology and Social Work. In addition, Kelli has a Master of Science degree in Human Services Management from Franklin University. Tiffany holds a Master's degree in Speech-Language Pathology from the University of Cincinnati. 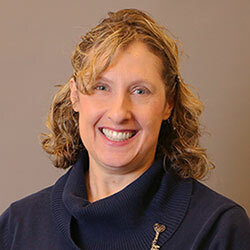 She has a license in Speech-Language Pathology through the state of Ohio and has earned a Certificate of Clinical Competence from the American Speech Language Hearing Association (ASHA). Over the past 13 years, Tiffany has served as a Speech-Language Pathologist, Primary Service Provider, and supervisor in early intervention programs within the states of Maryland and Ohio. As an Early Intervention Supervisor, she provided ongoing support and training related to evidence-based practices in EI. Tiffany has also taught Hanen, It Takes Two To Talk workshops to parents of toddlers with language delays. Shelly Palumbo has a Bachelor's in Social Work from Capital University and is a Licensed Social Worker in the state of Ohio. Shelly has worked as an Early Intervention Consultant at the Department of Developmental Disabilities for 2 years. Shelly has recently obtained her Fidelity Coach Certification from FIPP. Previously, she was employed at the Ohio Department of Health as a Human S Services Program Consultant for the Help Me Grow Home Visiting Program for 3.5 years. Shelly has 15 years' experience working within the Help Me Grow Program as a Service Coordinator, Home Visitor, and as a state consultant. Shelly has 24 years of experience working in the field of Social Work, with 17 years spent supporting individuals and families in their homes. Lori has a Bachelor's from the Ohio State University with a double major in Psychology and Communication. Before joining DODD in 2015, she worked for 24 years at Opportunities for Ohioans with Disabilities (OOD) as a Disability Claims Adjudicator, Trainer, and Policy Specialist. While at OOD, she chaired the Knowledge Enrichment Group, a committee that planned trainings on medical, legal, and technical aspects of disability adjudication. 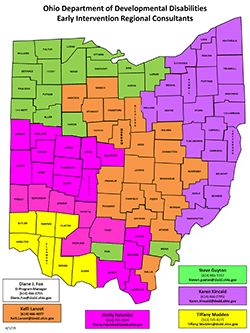 She served as Vice President and President of the Ohio Associaton of Disability Examiners, and she was awarded the Social Security Regional Commissioner's Citation. Outside of work, she is involved in community arts groups as a choreographer, singer, and dancer. 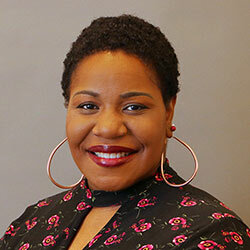 Shakila Dixon first worked with the Early Intervention program in 2012 at the Ohio Department of Health. Prior to joining the EI team, she worked in a variety of fields and settings that supported executive leadership function. Shakila has particularly enjoyed working with healthcare projects, including including projects measuring the quality of healthcare in the Medicare/Medicaid populations in Ohio. Her 23 years of administrative experience allow her to support a variety of projects in the EI program. Additionally, Shakila is actively pursuing her Bachelor of Science degree, majoring in Business Administration at Capella University.